General Heinz Guderian led German armored formations and fell in and out of favor with Hitler. Hitler was enraged as he stalked his way around the room during the waning months of World War II. Heinz Guderian, his acting chief of the general staff, was again speaking out, again opposing the Führer’s plans for dealing with the Soviet Red Army, which was steadily approaching Berlin. This man, whom Hitler had earlier promoted to inspector general of the armored troops, had advocated in early February 1945 that German troops be evacuated from the Balkans, Italy, Norway, and especially Courland along the Baltic to bolster the defense of the Fatherland in the wake of the failed Ardennes offensive in the West and dogged, determined Soviet advances in the East. According to Guderian’s account, Hitler raged, shaking his fists so close to Guderian’s face that his assistant pulled the general backward by the bottom of his uniformed jacket to prevent him from being struck by the furious Führer. The result of the confrontation was not the withdrawal and reassignment of the much-needed troops but rather a limited attack on the Arnswalde area in the hope of defeating the Soviets north of the Warthe River and thus retaining Pomerania and the link with Guderian’s native Prussia. Matters heated up even more dramatically in a February 13, 1945, meeting at the Chancellery in Berlin. Guderian noted that intelligence showed the Soviets could increase their forces on the River Oder by some four divisions per day, necessitating the launch of an attack within two days. Heinrich Himmler, leader of the dreaded SS, who was charged with defending that area, argued against the attack, contending that additional fuel and ammunition would be needed beforehand. Hitler took offense at Guderian’s comments, saying he would not permit him to state that Himmler was incapable of performing his military duties. The confrontation raged for two hours, with the Führer hurling accusations, his veins standing out on his temples and his eyes seemingly ready to pop out of his head. All the while Guderian stood his ground, determined to let nothing destroy his equanimity. He simply repeated his “essential demands” over and over again with icy consistency. The arguing stopped suddenly, with Hitler approaching Himmler and stating that General Wenck would arrive at his headquarters that very night to take charge of the attack. Two days later, the army was ready. The attack began early the next day. The initial effort went forward well, but Wenck was badly injured in a car accident two days into the attack. In his absence the advance bogged down, and the initial momentum was never regained. The Red tide was overwhelming and, combined with Allied advances in the West, the Third Reich collapsed within a few months. Guderian had been right in his argument, but this larger than life general was to pay for his audacity in standing up to Hitler. In a somewhat similar stormy March 28, 1945, Chancellery meeting, Guderian again stood his ground against Hitler and the “bobbing heads” of the Führer’s inner circle. He was sent on a six-week medical leave, departing Berlin to be with his wife before eventually becoming a U.S. prisoner of war. Guderian was one of a fortunate few. His independence, proven battlefield brilliance, the absence of documented war crime activities, and his polished writing skills were to serve him well in the coming years. In 1937, he had published Achtung Panzer!, a groundbreaking primer on the use of armored formations in warfare. His Panzer Leader, a 500-page-plus memoir, was to later burnish his military accomplishments and solidify his role as one of the leading German military figures in World War II. The 1952 book quickly hit the bestseller lists and was reprinted in several languages. But how much of that memoir was objective and how much was self-serving? Was Guderian truly the “Father of the Blitzkrieg,” as one book publisher contended? Was he the “Panzer Pioneer” in the use of tanks in World War II, or merely one of several military men who foresaw and fostered the development of tank warfare? Guderian was indeed fortunate at the end of the war. He managed to fall into Allied hands, and he avoided the taint of war crimes and the prolonged life and death drama of the Nuremberg Trials. The Americans resisted Soviet efforts to get their hands on him. Unlike many of his comrades, then, Guderian had the time, motivation, and inclination to write his memoirs. And he managed to complete his book well before more detailed and classified materials became available. That meant that historians found themselves heavily reliant on Guderian’s work and his personal perspective when writing about the tank commander’s exploits in World War II. As more materials became available, later writers began to take a more nuanced view of Guderian, questioning his role as the developer of tank warfare and as the panzer pioneer. The idea that Guderian was also involved in discussions to assassinate Hitler is also raised. Such activity would have made him a traitor in Nazi eyes. Guderian was a complex, bright, self-confident, technological innovator. As a young officer in World War I, he took it upon himself to take a flight over the Ardennes in a frail biplane to get a better look at the enemy formations facing his troops. That experience and his personal knowledge of the terrain were to pay handsome dividends years later when his tanks swept through the area and helped pin the Allies against the French seacoast. He was an early adaptor of technology who saw the need to use radio communications to ensure the tight and coordinated movement of tanks across the battlefield. The innovative use of radio communications also enabled him to lead from near the front, where he could effectively see and “feel” the battle develop. Guderian’s appreciation of technology and his command of the English and French languages supported his advocacy of tanks and the use of vehicles to transport men and matériel on the battlefield. In the interwar years, he read the works of Britain’s J.F.C. Fuller and B.H. Liddell Hart, as well as those of a young French officer named Charles DeGaulle. Fuller was involved in planning the successful British tank attack at Cambrai in 1917, and he developed the first real armored warfare doctrine, Plan 1919. Fuller saw the tank as a truly decisive weapon that could force a breakthrough of enemy lines, offsetting the comparatively slow pace of advance by infantry. He foresaw that tanks with their armor, firepower, and mobility could withstand enemy firepower in approaching enemy defenses, overcome them, and rupture the front. Fuller also advocated deep penetration of enemy lines to sow confusion and panic, causing the collapse of the entire front. Surprise, concentration, and mobility were keys to the approach advocated by Fuller. Liddell Hart also served in World War I and later used his writing skills to spread his view that future wars would be dominated by mechanization and airpower. He stressed striking at the weakest spot in the enemy’s defenses with a strong, disruptive blow to knock the opponent off balance as armored units penetrated deep behind the lines well ahead of the rest of the army. Ironically, it was the Germans and not the British who managed to develop these theories of armored warfare during the interwar years. De Gaulle, for his part, was locked in the interwar French Army with its traditional ties to the horse. Nevertheless, de Gaulle and his tanks did perform well in counterattacks against Guderian’s tanks in the German drive from Sedan, May 17-20, 1940. Guderian had the drive and ambition, while Hitler provided the opportunity. He used his ability as a technological innovator to further his ideas and career, helped along by the German desire to rebuild the military and avoid the prolonged trench warfare endured in World War I. During much of the interwar years he was fortunate to work under Oswald Lutz, who took Guderian under his wing as Lutz rose to become the first commander of German panzer troops. Interestingly, it was Lutz who suggested in late 1936 that Guderian write Achtung Panzer! It was an amalgamation of Guderian’s war academy lectures and a review of the ideas of others. The panzers played a role in the March 1938 anschluss with Austria, and shortly thereafter Guderian began to receive rare invitations to dine and attend the opera with Hitler. Guderian’s favor with the Führer helped him to get posted to command a second-line defensive infantry corps during the planning of the August 1939 invasion of Poland. Guderian pulled out all available political stops and managed at least to get himself reassigned to command an untried motorized corps rather than the XVI Corps that had brought him notoriety in Austria. His corps performed well, and on September 5, 1939, Guderian provided a battlefield tour to Hitler, Himmler, and a young infantry officer named Erwin Rommel, who later gained fame as the Desert Fox. All the while he stressed that armor would be the dominant weapon of modern war. 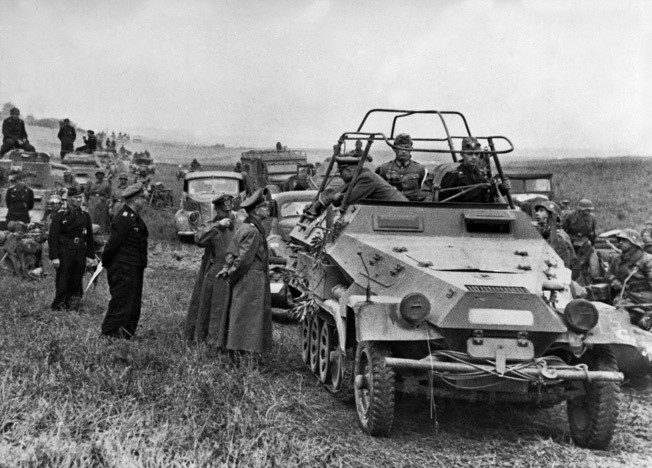 During the Battle of France in the spring of 1940, Guderian leans out of his command vehicle to confer with General Adolf Kuntzen, commander of the 8th Panzer Division. Guderian became known as a superb tactician during the campaigns in Poland and France, putting his theories of armored warfare into practice. Guderian obviously was a quick learner and a self-confident innovator, and there is little doubt about his military prowess. He stepped forward to endorse General Erich von Manstein’s plan to use tanks to penetrate the heavily forested Ardennes in a “sickle cut” to the English Channel, cutting off the bulk of the enemy forces in Belgium and Holland. That accomplished, Guderian then swung toward the Swiss border to trap more than 500,000 Frenchmen in a large envelopment that helped to bring the war in France to an abrupt end. Guderian also showed his military prowess when Germany invaded the Soviet Union on June 22, 1941. His panzer group was in the central thrust toward Moscow, crossing three major rivers, capturing 300,000 Soviet soldiers in the Minsk pocket, and taking that city and Smolensk with another 300,000 Russian prisoners along with 3,200 tanks and more than 3,000 guns. He had advanced some 400 miles into the Soviet Union and to within 175 miles of Moscow. In a controversial move, his panzers were then ordered some 200 miles south on August 21 to help take Kiev. That battle cost the Red Army another 660,000 men and an estimated 880 tanks and 3,700 guns. Guderian’s tankers retraced their steps and on September 30 resumed their attack toward Moscow. The panzers pushed forward and reached Orel on October 3, moving so quickly that the trams were still running as the Germans entered the city. Four days later the German pincers closed on the Bryansk pocket, netting more than 660,000 Soviet prisoners. Poor weather, logistical challenges, and stiffening Soviet resistance halted the Germans before Moscow. Guderian’s attempt to take Tula, a crucial city south of Moscow, failed, and on December 4 he shifted to the defensive just before the Soviets launched a counteroffensive using fresh Siberian forces backed with powerful T-34 medium tanks. Hitler was displeased with Guderian’s unauthorized pullback, and he sacked the general on December 26, 1941. In many ways, the self-described panzer leader was fortunate to have been dismissed. His reputation was not tarnished by the Axis defeat in North Africa, the retreat from Moscow, or the disaster that befell the Sixth Army at Stalingrad. On February 28, 1943, Hitler named Guderian inspector general of armored troops to direct a reorganization of the panzer forces and speed up the production of much needed heavier tanks. It was his first field command in two years, and Guderian moved forward with his usual energy. Guderian’s irascibility, which had earned him the nickname of “Stormy Weather Heinz” in some circles, was to follow him to that new position. Although not directly involved in planning for the mid-1943 Citadel offensive and the resulting Battle of Kursk, Guderian did strongly argue against the use of the heavy Elefant and Nashorn tank destroyers and expressed concern about deploying the new Tiger and Panther tanks until reliability problems could be worked out. He witnessed the action at Kursk, and his concerns about the Tiger and Panther tanks were proven correct. According to one report, of the 200 new Panthers that saw action at Kursk, 42 were destroyed but only 43 remained operational as the Germans withdrew. The others had suffered mechanical breakdowns or battle damage. Guderian continued with his reorganization plan, which resulted in the estimated production of some 1,848 Panther tanks in 1943 and another 1,468 by May 1944. Following the failed July 20, 1944, plot to assassinate Hitler, Guderian was named acting chief of the general staff. He became occupied with new matters in that post, such as the continued Soviet advances in the East, Allied pressure in the West, and Allied bombing that slowly strangled German production capacity as the war continued. The deteriorating conditions and his continuing clashes with Hitler led to Guderian’s second dismissal on March 28, 1945. Perhaps the most intriguing question in Guderian’s background revolves around his possible knowledge of plans to assassinate Hitler. While his memoirs freely acknowledge some interaction with a few of the conspirators during his 1942-1943 period of unemployment, historian Russell Hart says Guderian “concluded the scheme lacked sufficient prospects of success to hazard his career and life.” But Guderian did not denounce the men, and that alone would probably have been enough to warrant his execution according to Nazi justice. 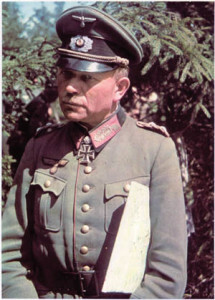 Hart goes further, however, contending that there is “strong circumstantial evidence” indicating that Guderian was more involved in the conspiracy than he admits in his memoirs. In June 1944, for example, he recommended to Himmler that Colonel Claus Graf von Stauffenberg, the leader of the conspiracy, become the Army’s chief of staff. That would have given Stauffenberg direct access to Hitler. Also, on July 19, 1944, Lt. Col. Karl-Henning von Barsewisch, Guderian’s former Luftwaffe liaison officer, met with the general and informed him of an impending attempt on the Führer’s life in a final effort to enlist Guderian’s participation in the conspiracy, says Hart. Hart also raises questions regarding Guderian’s actions on July 20, the day of Stauffenberg’s failed attempt on Hitler’s life. He traveled from Berlin to his Diepenhof estate in West Prussia that day and spent the afternoon hunting roebuck alone on his estate at the time of the assassination attempt. It was late afternoon before a dispatch rider located Guderian, providing him with crucial time to see which way the plot had gone, contends Hart. When he learned via a radio report that the plot had failed, he set about further isolating himself from suspicion. Guderian was able to do just that, and the next day a still bomb-dazed Hitler promoted the former panzer leader to acting chief of the general staff. Hitler also made Guderian a member of the “honor court” that screened and discharged members of the armed forces accused of involvement in the July 20 conspiracy. The accused were then subjected to special Gestapo torture, convicted by a people’s court, and slowly strangled to death by piano wire. Guderian’s role in the honor court is troubling, especially if he indeed had advance knowledge of the plot. He voted to expel fellow officers from the military based solely on Gestapo interrogation and intelligence reports, denying them opportunities to present a defense or call witnesses. 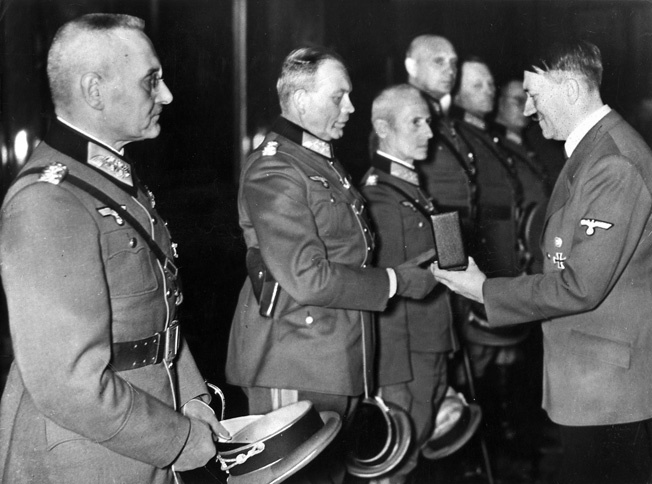 Adolf Hitler presents the Knight’s Cross medal to Guderian and other officers in October 1939. Guderian fell out of favor with Hitler, in part due to his willingness to oppose the Führer on military issues. Also disturbing were Guderian’s actions during his 1942-1943 period of inactivity when he was seeking property in conquered territory that he might claim for his own. He settled on a 2,500-acre estate of excellent farmland at Diepenhof and managed to have the Polish owners forcibly evicted. Hitler approved, seeing such gifts as a way of tying his military commanders to him. The estate was “the largest single bribe” Hitler ever gave to any of his field commanders, contends Hart. In addition, since August 1940, Guderian had already been receiving special tax-free monthly payments of 2,000 Reichsmarks, effectively doubling his gross salary. Guderian proved to be a very bright and very complex individual. He was a proven general who could and did make quick, difficult decisions. For the most part, his men loved him, his peers respected him, and his superiors often grated at his impertinence. One superior, Field Marshall Gunther von Kluge, was so enraged by Guderian that at one point he actually petitioned Hitler for permission to challenge the tank commander to a duel to settle matters, a request the Führer denied. Guderian and most of the German military in the 1930s saw Hitler’s rise to power as a wave they could ride in furthering their own careers while rebuilding the German military. With experience and instinct, he was prepared to strike when opportunities presented themselves, both on and off the battlefield. On the battlefield such acts can prove productive. In civilian life such acts can be seen as opportunistic, as in his ready acquisition of the large estate. While he was a technological innovator, he was not the first or only advocate of tank warfare. Others came before him. Guderian’s first book on tank warfare appeared before the war; however, he actually had to pull political strings to gain command of a mechanized corps for the invasion of Poland in 1939. Although not historically the first panzer leader, he did epitomize and demonstrate what tankers could accomplish when led by a determined, well-trained, and fearless commander. Both the Soviets and the Western Allies were indeed fortunate that the talented Guderian proved so irascible to Hitler and the Nazis that his considerable energies and abilities were never fully harnessed and directed by the Third Reich. Tags Adolf Hitler, Allies, Ardennes Offensive, Axis, B.H. Liddell Hart, Battle of Kursk, Battle of Moscow, Blitzkrieg, blitzkrieg in poland, Charles de Gaulle, Claus Graf von Stauffenberg, Eastern Front, Erich von Manstein, Erwin Rommel, European Theater, general heinz guderian, Gestapo, Gunther von Kluge, Heinrich Himmler, J.F.C. Fuller, Moscow, Nazi Germany, Nuremberg Tribunal, Operation Barbarossa, Operation Citadel, Poland, Schutzstaffel (SS), Soviet Union, T-34 tank, Waffen-SS.